McIntosh Farm Machinery build a line of high capacity chaser wagons with the same rugged and durable design and with features forage contractors are looking for. 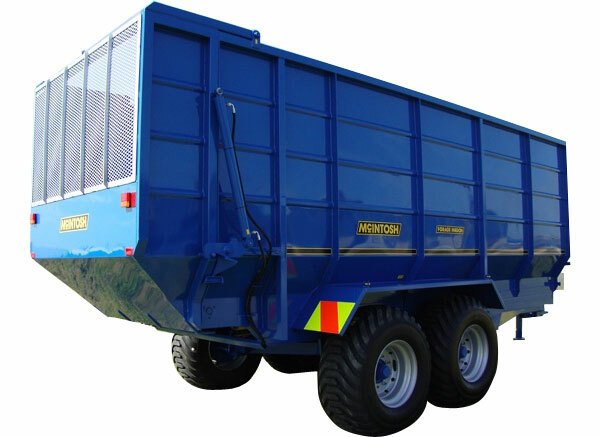 The McIntosh Chaser Wagon is used to carry cut silage and Maize to the silage pits. Our chaser wagons can drive over the stack when unloading and are more stable on hills than tip trailers. Along with our other agricultural machinery products, our chaser wagons are manufactured using quality steel and parts sourced from NZ, Germany, and Italy. These machines are designed and manufactured in our large engineering workshop and are sandblasted and painted in our purpose built booths. Through farmer and dealer input from NZ and Australia the machinery is designed and developed with our R&D team using the latest 3D drawing program. The tailgate is designed with the tapered back to give maximum clearance for entering and exiting off stacks. The high lift ensures plenty of clearance for quick efficient unloading. High speed hydraulic floor drive system with a top quality, German made reduction gearbox. 4x10mm high-tensile floor chains, bolt on floor slats, and a large 55mm drive shaft all ensure reliability and long lasting durability. Includes: heavy duty 8 stud axle assemblies, 9mm heavy wall walking beam, large floatation tyres and a 63mm pivot pin with 50mm offset. This ensures a rigid closure at all times to prevent spillage. The safety valve prevents accidental floor movement whilst the tailgate is closed. 9mm RHS heavy wall chassis frame complete with single bar drawbar pull and swivel tow eye. All units are sand blasted prior to priming and final coat painting. This gives a more durable and longer life finish and minimizes rust. McIntosh Chaser Wagons can be custom built to suit your individual needs. Sizes of units and specifications can be altered to suit your requirements.